REGION — The green tops of brush filling the canyons and terrain throughout San Diego County is merely masking a potentially dangerous situation. 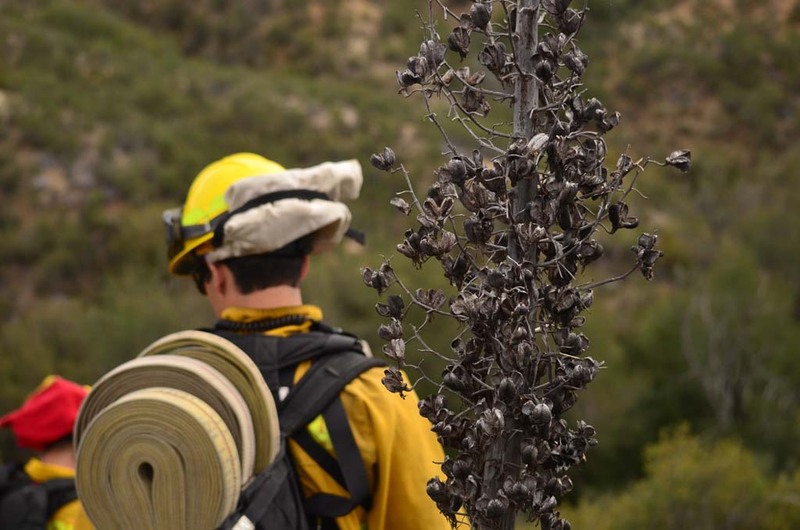 Beneath the greenery, are dead stems and twigs — fuels long since dried out from prolonged periods without rain that have county fire officials and Cal Fire predicting this season to be an above normal fire season. “All the predictions are leading us to believe that it’s going to be an extremely active fire season,” Capt. Kendal Bortisser, a Cal Fire public information officer, said during a three-day wildfire training exercise that took place earlier this month. More than 700 firefighters from departments all around the county participated in the training exercise at the Viejas Indian Reservation. “The whole idea behind this exercise is to give the firefighters the opportunity to kick the dirt off their boots, get on the brush engines, get out there lay some hose, cut some line, work with the aircraft in preparation of the upcoming fire season,” Bortisser said. The exercises, he equated to the analogy of cutting your firewood before the winter. “You don’t wait until it starts snowing before you cut firewood,” he said. Predictive Services for the National Interagency Fire Center is seeing an above normal fire activity level in the county for May through July, typically the peak fire season period. “Even though we’re in fire season year round, it’s going to start kicking up in next several months,” Bortisser added. Cal Fire, as recently as April 10, announced the hiring of nearly 100 additional seasonal firefighters for the Northern California region to help prepare for the season. Normally Cal Fire operates staffing levels in three different seasons: Peak, transition and winter. “During peak is when we step up all of our apparatus, all of our stations, camps, crews; all of our aircraft – everything is fully staffed,” explained Bortisser. Cal Fire moved into peak staffing levels the first week of April — that’s earlier than most fire officials can remember, Bortisser explained. Mid-May is when peak staffing levels are traditionally achieved. “That’s a result of the lack of rainfall, the drought, the fuels — a number of different conditions that are pushing us into staffing so early,” he added. During the winter is when Cal Fire begins laying off seasonal firefighters, but they were never able to do that this season. Cal Fire never went into winter service staffing levels for San Diego County. The wildfire training exercise started about 12 years ago after the Pines fire in Julian, but really began to take hold following the Viejas and Cedar Fires in 2003, said Brad Rushing, incident commander for the drill. “Right now, we’re in a long term period of drought. It seems that the Southern California area has been hit really hard in the past decade and there’s been a lot of lessons learned from those fires over the past eight or 10 years and this drill continues to evolve with those new situations,” he said. San Diego County remains under extreme drought status, according to the most recent data from the National Integrated Drought Information System.